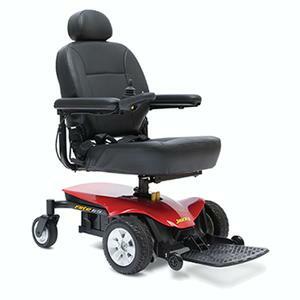 The reliable and sporty Jazzy Elite ES features two motor, in-line, front wheel drive technology for supreme maneuverability indoors or out. The Jazzy Elite ES is equipped with 3″ solid anti-tip front guiding wheels to ensure stability and has an impressive per-charge range of nearly 9 miles. An Armor controller guard protects the control shift from daily wear and tear. The high back and headrest of the Jazzy Elite ES enhances the stylish, sporty feel of the chair. Shroud decals are included if you want to add more pep to its appearance! 35″ Unit Weight: 153 lbs.